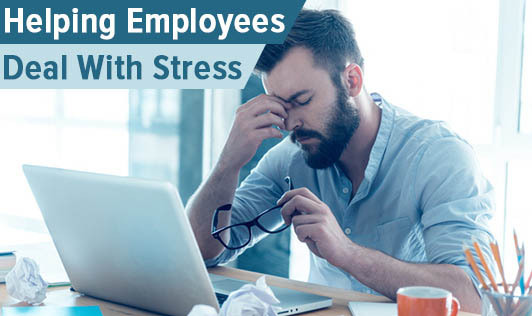 Feeling anxious and stressed at work can cause negative physical and emotional health effects on employees, resulting in higher health costs and low productivity. High stress can lead to depression, substance abuse, anxiety, compulsive behaviours as well as insomnia, fatigue, headache, high blood pressure and hypertension. Recognizing the signs of stress: Identifying the signs of stress at an early stage increases the possibility of action that can be taken to deal with the symptoms and underlying causes, thus minimising the risk to the individual's health and well-being and the effects on the department. • Make sure that you treat employees the same way as those with a physical problem. • Discuss the issue with the member of the staff and demonstrate that you are concerned about their health. • Conduct a basic risk assessment to get an insight into the employee's stressors. • If the work is affected, explore the option of a referral to occupational health. • You can discuss with the employee on any action that could be taken to alleviate the stress, for instance- simple modifications at work for a short period, increase communication etc. • Consider documenting agreed actions and actively follow up to ensure stress levels have been reduced. • It is important that managers review and if necessary, modify the work tasks and responsibilities of individuals who have had sickness absence due to stress as a result of their work. • Lastly, managers need to be aware of the impact of stressed employees on other members of the staff. Early intervention and action will reduce the likelihood of the individual becoming ill and needing to take a sick leave which in turn will increase the possibility of a successful outcome for both the individual and the department!